Infinite SUPPLY of TEST Posts. Celebrating 120 Years of Komiks From The Philippines. Just found out now that the current penciller for Spawn is a Filipino. Some of my favorite artists including Whilce Portacio, Leinil Francis Yu, Jay Anacleto and Francis Manapul were also mentioned in that article. If you are a coder, do not be like Batman. Be like Saitou. I was reading Joss Whedon's interview from a not so old issue of Wizard Magazine during a coding break. Nice interview from this creator of Buffy. Though I can't remember finishing an episode of Buffy on TV, his works on Astonishing X-Men caught my attention. Including the thousand others who consider it as one of the best X-Men runs since Claremont/Byrne and Morrison/Quietly. It also made me go back to reading X-Men books after not reading them for... 12 or more years. In one part of that interview he mentioned that comic books should not glorify killing and guns. Not killing makes Batman's work even harder. It what makes Batman... Batman. In fact, not killing The Joker backfired on him and the people close to him so many times. But I believe Batman's principles are not applicable to the programming world. Well at least his no-kill policy isn't. Programmers should be given licenses to kill their users. Ah wait... did I say users? Kill bugs right then and there. Kill bugs like there's no tomorrow. Let them pass... ignore them... just jotting them in your bugtrack file is not enough. You have to eliminate them on site. Coders should instead take a page from the book of that character from that awe-inspiring manga Rurouni Kenshin named Saitou. Had Saitou been living in this era of computers... he would've become a great coder. He would be the coder where all other coders will be measured. Live by that code, coder. Now I'm hearing some coders whispering that if we kill all those bugs and make things perfect, the software industry which relies so much on subscriptions/upgrades/versions would not grow. Batman � DC comics. 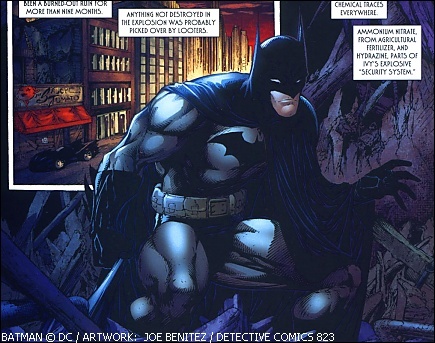 Batman artwork above (and Poison Ivy artwork below) from Detective Comics 823. The Joss Whedon interview can be read in Wizard Magazine's March 2006 issue. Issue number 173. I'm having some problems posting. I'm not sure if it's my ISP or the CGIs. Third TEST for THE DAY. Folder is inaccessible. Access denied. Thor to the rescue. You changed and re-installed a new Windows XP OS. Let's say on a new hard disk... slaved your previous primary disk. You tried things. Fired up some admin tools. Whine and groan... cast spells and nothing works. You're pretty sure you haven't set those folders to 'Private' before. Good thing you haven't deleted your previous OS. Re-swapped drives again and you still can't access it in its new location. You now start calling the gods of thunder. Yeah Thor... no not the Civil War cloned one. Thor suggested you copy the files to another PC through LAN/network. He even told you to clean up the original folders. Since you can't delete them when you're using the new OS already. Then you start transferring 8GB files for 30++ minutes or so. A lot of time wasted though. I'm sure there's a more efficient and logical way to solve this but I haven't googled that much after solving the problem. Now I'm faced with the same problem again. I can't call Thor this time. He's into ballet lessons with Namor somewhere in an undisclosed area. From what I've heard Ben Grimm is joining them this week too. Luckily I discovered a shorter way. Right click on that inaccessible folder. Click Sharing and Security. Check Share this folder on the network. Check Allow network users to change my files. It will display an error message... possibly show that sands of time wait icon but it will make that forbidden folder accessible once more. This is a sort of short circuit... or whatever you call it. I'm still looking for the real cause and the real documented solutions. If you know one fire me up. I'm using the admin account and I'm too lazy to test it using another non-admin account, if the 'solution' works. It works... but think of the security-related issues on the other side of the fence. Time to end this... my linux zealot friend's here. Probably he'll invite me to join Thor and Namor one of these days. SPS: VFPCompression Library (ZIP/UNZIP for Visual FoxPro). Updates here and here. Alien ate this portion. We'll retrieve that post later. Technology and the products of innovation should not only be for the rich. Rich financially and... well, intellectually. It should be for everyone. And my pet's friend's imaginary pets. The most successful tech companies... and innovators know this. Understand this. Breathe this mindset. It's in their blood streams.